Thanks to some collaboration with Facebook friends, we have come up with the death horoscope for Osama bin Laden. The location was the city Abbottabad, Pakistan. The operation started on the 2nd of May 2011 at 1:00 am  and was completed in 38 minutes . So the chart below is set for 1:38 am, using the exact coördinates of the compound where Osama bin laden was killed . The time looks good because the Ascendant of matches that of Barack Obama. The Vertex is also conjunct Obama’s Vertex, and the Part of Fortune is conjunct Obama’s Chiron. I’m not going to go into conspiracy theories about the body, or whether Osama bin laden was behind the September 11 attacks. On its own, this event is hugely significant regardless of how and why we got to this point in history. It was meant to be this way. The Vertex on Barack Obama’s Vertex says this was his destiny. He reaps the rewards, the January solar eclipse was trine his Vertex. 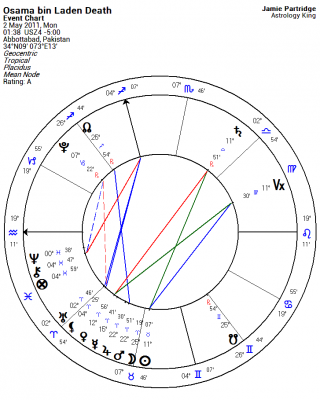 Mars is conjunct Jupiter in this event chart. This is an “action transit, initiative, boldness, courage and aggression will be strong”. With Venus opposite Saturn that pumped up aggressive energy needed to be channeled into “conservative, well planned projects”. Obama did well opting for the commando operation instead of bombing the place. Saturn delays and patience paid off. For the last few months I have been seeing astrological signs of a new spiritual leader on the horizon. One reason is because Chiron is has been conjunct the fixed star Fomalhaut. Chiron is the healer/teacher and is associated with the prophets like Christ and Muhammad. The chart below shows Chiron highlighted by the Part of Fortune, another spiritual influence. Both are on the fixed star Fomalhaut, one of the four royal stars of ancient Persia. It is associated with the archangel Gabriel, which Dr. Eric Morse believes “must now be said to challenge or actually supplant, with a new stage in human spiritual evolution, the supremacy of the more ‘medical’ Archangel of the Leonine era.” The “medical” archangel he mentions is Raphael, the fixed star Regulus, now directly opposed by Neptune. The death of Osama bin Laden opens up space for the emergence of a new figure head for the Islāmic world. This is what Iran’s Mahmoud Ahmadinejad has been referring to as the 12th Imam . Revolutions and weakening of pro Western regimes in the Arab world provide fertile grounds for the rise of a new spiritual leader. Another recent sign pointing to a new spiritual leader is the activation of the fixed star Kurdah, at 24 degrees Aries in the constellation of Cepheus, the King. Kurdah is not the brightest star in Cepheus but it is notable being opposite the two most fortunate stars in the heavens, Spica and Arcturus. Anne Wright has found that this star is associated with kings and rulers, and their assassinations . 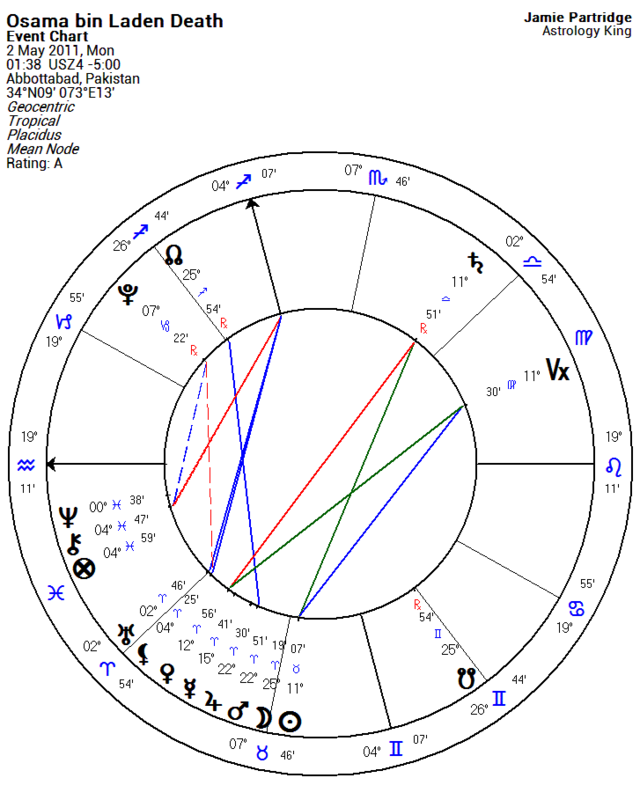 The Moon in the chart below is conjunct the fixed star Kurdah. Mercury stationed retrograde on this star a month earlier. Now in direct motion, Mercury hits this star again on May 11 with a conjunction of Venus and Jupiter. 4. Dr Eric Morse, The Living Stars, p.56. 6. Constellations of Words, Events in History, Cepheus. rob: a challenge = Osama’s natal chart showns no particular aspects of significance at time of raid……ja oder nein!? Chancelor Merkel need not answer…. What is it that you are saying? Are you saying this probably?, possibly?, likely? indicates Osama was not killed during the raid? Hi Jane – well, I would like to hear what others have to say – we do not have a birth time for ObL but we do have a date and place 10th March 1957 Jiddah, SAr – ok, yes, I’ve looked at the event chart against his natal and am intrigued by what I found – in an earlier comment Marina mentioned that Jamie had not compared the event to the natal charts, but, its worth doing as, yes, it raises questions – hope thats not too cryptic, just don’t want to prime an answer…..for comparison, and to put the cat amongst the pigeons, the chart of the Tora Bora event against natal chart is worth a look…..
……just to give a little more context on this – one of the central questions around bin Laden is the secrecy and foxiness that surrounds the whole story, the way the US gov and Osama have been playing off against each other over the years, and with this announcment it begs the question – if astrology can point to any answers or increase the probabilities about whether this is just another scam, that he was actually already dead, or otherwise, they must surely be worth knowing – there are too many questionable elements within this op and how its being ‘presented’ going unanswered, especially from the US gov side (the media is another matter), and its a strand that this thread could develop – perhaps not….? Thank you for your response Rob. I’m keen to see you and other astrologers intelligently explore this further … so please do. I would be most grateful. Many people are questioning whether BL did die only recently in the alleged raid. Given this has come on the back of Obama’s birth certificate saga, the questioning is not a surprise. Surely the stars can shed some light on this. Rob, given Osama BL had Sun Lilith Venus Venus conjunct in Pisces, Cancer Moon Sextile Scorpio Neptune and Gemini rising, woudn’t the hide and seek picture fit him? Gemini is a tricky little sign! left hand doesn’t want the right hand to know what its doing… I have observed Gemini in action this way – it is capable of real treachery on one side while masking itself with moral superiority on the other. I was always intrigued by him! And going into Icke terrotory now – not my style at all but if ever there was a candidate for a reptile based humanoid/alien – as per Dulce Base – then Osama could fit the bill! Yeh, if we go with a midday birth time we get Gemini rising natal for Osama – I’ve played with this and it fits best, perhaps too well, but, within the 24 hrs possible for the BT the Moon swings through 15º from 26 Gemini to 9 Cancer – Cancer Moon fits well with Neptune trine in Scorpio – gives him a propensity for keeping his soul hidden behind a protective veil, a pervasive behind the scenes presence and inner charisma, and this would be fairly representative if his Moon is 1st house. My preference however is to stick pretty much with the aspects alone here…..
Something unusual in Osama’s chart is not only Mars conjunct Algol, but, asteroid Lilith is conjunct Alderbaran sextile Eris in Aries – we know of Alderbaran’s potential to bring both positive and negative influence, both inspirational and possibly delusional, but, with ast Lilith this looks like a dangerous set up – natal Eris is conjunct Algenib which Robson says gives ” notoriety, dishonor, violence, misfortune, and denotes the naked and poor professional beggar” – being in the wing of Pegasus, Osama would be lifted by Eris’ reactive influence, perhaps a contrived interpretation that never the less fits the bill, and sext ast Lilith makes him a potentially very dangerous individual if crossed, being bound to a missionary zeal through Pegasus influence – the point is that at the event time the Sun would be vitually on the mid-point of these two – for me they count a lot towards the unpredictability and darker side of his errant and reactive instigation of violence – this is driven home by natal BM Lilith squaring his nodes, again activated by sextile at the event time by the Moon, Mars+Jupiter combo – BM Lilith is conjunct Nashira, a fixed star with the reputation that “It causes overcoming by evil, which is turned to success, and gives danger from beasts.” [Robson] – if indeed he has a first house Moon in Cancer these influences may make him prone to projecting his own darkness onto others….its a moot point, but one that the event chart brings home to roost, literally…..
this is to just feed in a leader really, no conclusions, but, it gives me the inclination to take the op as it is being presented as reality after the fact – the pressure and exact timing on those nodal tie-ins are too close to overlook, but, I pull back from saying that this shows his death, as it happened – more a case of ‘this works for the op to look convincing’ – it is the Tora Bora attempt on his life that squeezes more juice out of the myth – anyone care to take a look…..
Marina’s reference to the Moon’s background influence on current events got me thinking about the esoteric-hidden-occult energies that are reflected off the Moon onto Earth and into our psychic apparatus. The original remote viewer Ingo Swan saw some very interesting activities on the back of the Moon when he was asked by a rather secret government agency to have a look for them. David Icke has gone further and is off on his adventure of the Moon Matrix as a control factor here in human consciousness. This link takes one to a quite good article on the Sanskrit texts understanding of the Moon and its influence. However, it requests that the reader not copy & post bits. The Pursusha Sukta (hymn 10.90 of the Rigveda) says that the Moon is born of the mind of the Cosmic Being, the Virat Purusha. Metaphysically speaking, our Moon is controlled by the Cosmic Mind. Our individual minds are portions, aspects, fragments of the greater Cosmic Mind and thus we ‘feel’ controlled by the Moon. Not to dive too deeply into the Sanskrit view, but more from your own feelings and experiences reading charts – any ideas on how moonlight and more importantly, the invisible energies being reflected off our Moon work. What is this energy coming from the Moon and the stars? And maybe there are some who have knowledge of Vedic astrology in this matter. 73. There are crores (1000s) of constellations and as many stars too. 75. The stars occupy their own abodes. These luminaries are the abodes of pious persons. 76. The abodes are created by the Self-born Deity at the beginning of the Kalpa. They stay up to the dissolution of all living beings. 77. These are the abodes of the deities in all Manvantaras. These deities identify themselves with these abodes and stay till the final dissolution. 78. The abodes of those who have gone have vanished. 79. In this Manvantara, the planets reside in aerial cars. When we examine the influence of the Moon on our planet and our psychic apparatus, the subtle body (puryastaka), we also look at the Sun. For it is the always-in-motion, ever-changing relationships between Earth, Moon, and Sun that govern tides in water and our consciousness. The Rig Veda (the Shyam Ghosh 2002 translation) contains profound insights into the nature of light from the Sun caught by and reflected on the Moon. This ancient Sanskrit text says that our Sun is only ‘one visible spark (star) among trillions of visible and invisible sparks’ of that vast Cosmic Radiation that pervades the universe. The Sanskrit word CAKRUH implies cycling, whirling. The chakras in our bodies are spinning spheres just like the heavenly bodies. The word AGNI, which is often translated as fire, comes from the root AG meaning to move tortuously, curling. Ghosh sees Agni as a cosmic ‘thunderbolt’ in space –– zigzagging thunderbolts with heat, light, sound, and motion enfolded within. Our Sun and Moon are temporal appearances, aggregate forms of the infinite energies that abound in the ubiquitous plenum – just as each of us is a portion of the Oneness that permeates and pervades the All. The heavenly bodies and our bodies take on the “appearance” of separation in Time/Space so that we may play here. As astrologers we read the invisible-to-the-five-senses forces based on the ancient art – the source of which no one knows – our intuitions and conclusions from cumulative readings. Planet of the Fourth Ray : ~Harmony Through Conflict~ there’s a relevant theme. From the ~soul centred~ esoteric perspective, the Moon has no essential life value. It is a storehouse for the past – especially that past which is characterised by outworn and discarded astral images and desires. Although our attunement with the essential wholeness of life is steadily growing, a number of us are still struggling with the relationship between our soul awareness and our involvement with our physical, mental, and especially our emotional lives. This is the ~cross~ that we bear, is it not? And it is this ~cross~, and the sacrifices and re-orientations that it requires, which lead us more assuredly to a place of greater consciousness. As we move towards the fixed cross we are moving through the illusion of the Moon, trying to perceive beyond the maya of pre-conditional forms of body, mind and emotions, and into the reality that is Love/Wisdom. When an individual has learned how to detach himself from the magnetism of his lunar past, one of three planets can be substituted for the Moon?s placement and traditional function in the natal chart: Vulcan, Uranus or Neptune. The Moon is then said to ~veil~ that planet?s effects. When a person is leaving the Mutable Cross and is about to mount the Fixed, the effects of Vulcan are very noticeable. Vulcan rules that process which ~breaks the chains~ to form.. As the ~Blacksmith of the Gods~ Vulcan forges new tools for the expression of consciousness. Past patterns of behaviour are dissolved in favour of a growing awareness, which leads ultimately to detachment from the desires and compulsion of form. When the Moon veils Uranus, the individual becomes a vehicle for the birthing of new archetypes of human consciousness. One is freed from the past – Uranus the ~revolutionary~ has seen to that. A new focus for form , one more appropriate to the current evolutionary stage of life, appears.. when the energies or Uranus are substituted for the position of the Moon in the natal chart, the individual consciously acts as part of a group effort working to bring in these new archetypes for the betterment of humanity. Apparently it was a spent force even before Lemuria having spent all its energy bringing life in material form to Earth. Susan: The Sanskrit word CAKRUH implies cycling, whirling. The chakras in our bodies are spinning spheres just like the heavenly bodies. The word AGNI, which is often translated as fire, comes from the root AG meaning to move tortuously, curling. Ghosh sees Agni as a cosmic ‘thunderbolt’ in space –– zigzagging thunderbolts with heat, light, sound, and motion enfolded within. /www.youtube.com/watch?v=tIbUK3c9zak – if you have time, Susan, or haven’t already seen it, watch this – it actually explains what the Thunderbolt in space – Agni, was. The Sanskrit word – Vajra – was a thunderbolt. This is the Vajra weapon of the gods. Actually a bol tof lightning – but of cosmic proportions. UQW – Thank you! I was hoping for some sharing of esoteric knowledge. The complexities of the astral planes are slippery slopes indeed! I thought you might get a kick out the the Thunderbolts connection. You are of course right about VAJRA. And the Rig Veda is written in a much older Sanskrit than any of the other texts. It was orally transmitted through the previous cycles of time. Which explains why there are so few translations – too hard! – and most of them useless. The translators would need to get into a similar consciousness as the original Seers – a tough order in the Kali Yuga. So the word for thunderbolt in the Rig Veda is POTRAM, from the root PU meaning to ‘cleanse, purify’. I felt your stellium would approve of this definition. Thank you for your excellent insights. As ever brilliant work fellow anorak! THanks so much for link to alt translation. I have always struggled with the hymnal aspect of the Vedas! But realise that once a milestone for humanity is recieved, it has to become formalised into a rote like drill, often learned but not understood! In the beginning was the word (sound) … and the word was God! BTW Thunderbolts are at a seminar /conf18.worldnpa.org/ NAtural Philosophy Alliance 18th Conference in Maryland in July. I’m sure its going to provide some great illuminations. Stay tuned. Over at the astro.com forum, a guy called Valik rectified Osama bin Laden’s chart, I’ll add it here. In July 2009 he predicted that “Its death will come 03.05.2011” European date format = May 3 2011. A stunning and genuine prediction, the admin over there checked and the post had not been edited. …responsible and credible academics and journalists see the direct connection between September 11,2001 and where we are today… and where we are headed as a planet. I am a molecular biologist and I’ve built a lucrative career in human genetics. I have run one of the world’s largest and most productive DNA genotyping facilities and now I am helping to build the global market for clinical whole human genome sequencing for the world’s largest human genome sequencing facility. I have worked with the absolute best genome scientists from the military, academia, medicine, and industry from around the world. I know DNA. And, one thing I know about DNA is that you cannot, repeat CANNOT: take a tissue sample from a shot-in-the-noggin-dead-guy in a north central Pakistan special forces op, extract the DNA, prepare the DNA for assay, test the DNA, curate the raw DNA sequence data, assemble the reads or QC the genotype, compare the tested DNA to a reference, and make a positive identity determination…. all in 12 hours- let alone transport the tissue samples all the places they’d need to have gone in order to get this done. I won’t be sure of the death of Osama bin Laden without real evidence but…if we have had some artworks come out portraying him as Christ then I am not disagreeing. So far it turns out that none of the atrocities he was accused of was committed by him…all the incidents have been traced as having been done by Mossad. 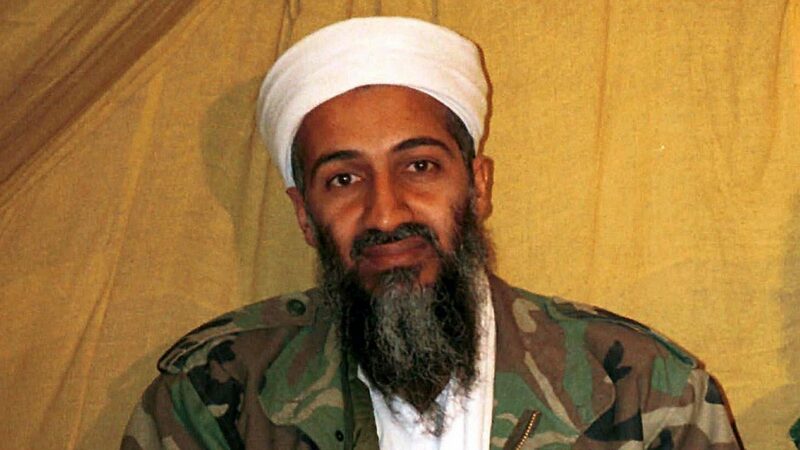 Osama was never on the FBI’s wanted list for the trade towers destruction. I think that what has happened…apart from being a Zionist attack on the Middle East…may have a more sinister meaning. that crew anyway….may have carried out a new crucifixion. For what purpose remains to be seen. Tolkien and C.S. Lewis were..through their Oxford connections…quite knowledgeable. Tolkien’s Silmarillion gives so many leading clues as to the identity of Morgoth/ Melkor/ Sauron who sought absolute world dominion. The one who sought the Light and, realising that he could not possess it for himself alone fell into darkness. He bound the three jewels into a crown of Iron and sought to bind all life to his will. C.S. Lewis gives a great description in the Last Battle…Shift the Ape who explains to the bewildered Narnians that he is really a man…who has lived for many hundreds of years and is, therefore, much wiser than anyone..and it is age that accounted for his appearance. As a quite open statement of who they believed was the antichrist I think they were both seeing right. If a new crucifixion is necessary to the dawning of a new era we have just had it. The next Kalachakra initiation is to be held in Washington DC between July 6 and 16th. Don’t anyone say they weren’t warned ! I am sorry if you mediated out my last comment Jamie ( or Marina ? ) or did it just get lost…please inform ! No we didn’t delete it. really sorry. And this applies to everyone. We lost a lot of comments in the migration to the new server. Please repost! It was potentially inflammatory actually so if it self deleted I wouldn’t be really surprised Spooks everywhere ! – But the 2012 is coming – A 35,000 thousand year cycle in humankind is now ending , and the wise men say, that now is the time make decisions and start seeing, the old structures will be broken – Despite the ruining of old models, economies, politicos and such, a lot of positive energy is now coming from The Universe, The Allmighty, for everybody to enjoy and become part of one’s awareness. I’m looking forward with trust and gratefulness – Not because a more or less harmless elderly man was shot in May – but because the humankind is not left alone. May 12, 2011 was when Jupiter entered Sidereal Aries. Nov 23, 2011 was when Saturn entered Sidereal Libra. Ye, I think it come from the ancient idea that the zodiac starts with Spica. Love that pic Mrs. Smith. I have been reading Cyril Fagan’s books and other Western Sidereal Astrogical material. It is based on using Spica as the fiducial star. That would have the Tropical and Sidereal Zodiac in exact alignment at 221 A.D. Using the Fagan-Bradley zodiac option for Solar Fire, I checked both zodiac charts for the Vernal Equinox. It was pretty much the same horoscope, but just a few minutes difference in time. I permanently switched to the Sidereal Zodiac, but I only use it as reference point for aspects. I am more of Cosmobiologist now. Jupiter entered Sidereal Aries on May 12, 2011,and so it was in alignment with Kurdah. Saturn entered Sidereal Libra on Nov 23, 2011, and so it was in alignment with Spica and Arcturus. I still use the tropical but like you only for aspects, plus I use precession for transits. I find it is easier since we have a popular blog so everyone can relate to the charts. Have you seen my chart? These Saturn oppositions this year are being felt hard. I know there is very little written about Kurdah, but it must be significant simply being opposite Spica and Arcturus. Robson says for Cepheus in general ” It gives authority and a sober mind, sometimes making its natives judges or arbitrators, but exposes to cruel and severe trials.” From experience this is true, and Kurdah I think would be the strongest star in Cepheus even though it’s not the alpha star, again because of its relationships to Spica and Arcturus. I can’t remember where, but I stumbled across some reference stating that in some culture Kurdah was the “Ape God”. Makes me think that this star represents very ancient ancestry or human evolution. We could see Spica and Arcturus as futuristic, where our species is evolving toward. Kurdah then is our past. Looking back on a past life regression I had about 15 years ago, it all makes sense personally.